David Oyetokunbo Oyelowo, OBE (/oʊˈjɛloʊwoʊ/ ə-YEL-ə-woh; born 1 April 1976) is a British Nigerian actor and producer born in England. He has played supporting roles in the films Rise of the Planet of the Apes (2011), Middle of Nowhere (2012), Lincoln (2012), and garnered praise for portraying Louis Gaines in The Butler (2013). On television, he played MI5 officer Danny Hunter in the British series Spooks (2002–04). Perhaps his highest-profile role was as Martin Luther King, Jr. in the American biographical drama film Selma (2014). Oyelowo was born in Oxford, England to Nigerian parents of Yoruba ethnicity. He was raised as a Baptist. He grew up in Tooting Bec until he was six, when his family moved to Lagos, Nigeria, where his father Stephen worked for the national airline and mother for a railway company. David attended a "'military-style' boarding school'. They returned to London when Oyelowo was fourteen, settling in Islington. While enrolled in theatre studies at City and Islington College, his teacher suggested that he become an actor. Oyelowo enrolled for a year in an art foundation course, at the London Academy of Music and Dramatic Art (LAMDA). He finished his three-year training in 1998. He also spent time with the National Youth Theatre. He began his stage career in 1999 when he was offered a season with the Royal Shakespeare Company playing roles in Ben Jonson's Volpone, as the title character in Oroonoko (which he also performed in the BBC radio adaptation) and Shakespeare's Antony and Cleopatra (1999) alongside Guy Henry, Frances de la Tour and Alan Bates. He is however best known for his next stage performance as King Henry VI in the Royal Shakespeare Company's 2001 productions of Shakespeare's trilogy of plays about the king as a part of its season This England: The Histories. 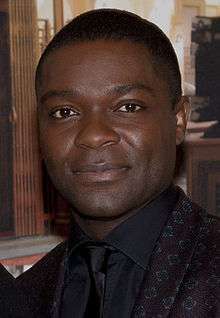 In a major landmark for colour-blind casting, Oyelowo was the first black actor to play an English king in a major production of Shakespeare, and although this casting choice was initially criticised by some in the media, Oyelowo's performance was critically acclaimed and later won the 2001 Ian Charleson Award for best performance by an actor under 30 in a classical play. In 2005, he appeared in a production of Prometheus Bound, which was revived in New York City in 2007. In 2006, he made his directorial debut on a production of The White Devil, produced by Inservice, his theatre company in Brighton which is co-run with fellow Brighton-based actors Priyanga Burford, Israel Aduramo, Penelope Cobbuld, and his wife, Jessica. He played Othello in 2016 at the New York Theatre Workshop with Daniel Craig as Iago, directed by Sam Gold. He starred in the HBO original film Nightingale (2014). He appeared as Olaudah Equiano in Grace Unshackled – The Olaudah Equiano Story, a radio play adapting Equiano's autobiography, The Interesting Narrative of the Life of Olaudah Equiano. This was first broadcast on BBC 7 on 8 April 2007, with his wife Jessica Oyelowo as Mrs. Equiano. As of 2014, he provides the voice of Imperial Security Bureau Agent Kallus on the animated series Star Wars Rebels. In 2012, Oyelowo appeared in Middle of Nowhere. Writer-director Ava DuVernay had been a fan of his work and had considered asking him to take the role, however before she could Oyelowo received the script coincidentally from a friend of DuVernay's who happened to be sitting next to him on the plane and was considering investing in the project. The film premiered at the 2012 Sundance Film Festival to critical raves. That same year Oyelowo appeared in Lee Daniels' The Paperboy, which competed for the Palme d'Or at the 2012 Cannes Film Festival. Oyelowo also stars in Five Nights in Maine, which was directed by Maris Curran. Oyelowo reunited with Daniels the following year in The Butler. He worked with his Middle of Nowhere director Ava DuVernay again for Selma (2014), playing civil rights activist Martin Luther King, Jr. The film, based on the 1965 Selma to Montgomery voting rights marches, had originally been set to be directed by Lee Daniels, but the project was dropped by Daniels so he could focus on The Butler. Oyelowo is slated to star with Lupita Nyong'o in Americanah, a film to be adapted from the Chimamanda Ngozi Adichie novel. The story follows a pair of young Nigerian immigrants who face a lifetime of struggle while their relationship endures. For his portrayal of Martin Luther King, Jr. in Selma, Oyelowo received in 2014 the Critic's Choice Award for Best Actor and the NAACP Image Award for Outstanding Actor in a Motion Picture. He received his first Golden Globe Award nomination for Best Actor in a Motion Picture – Drama. Also in 2014, for his performance in Nightingale, he won the Critics’ Choice Television Award for Best Actor in a Movie/Miniseries and was nominated for the Primetime Emmy Award for Outstanding Lead Actor in a Miniseries or Movie, Golden Globe Award for Best Actor – Miniseries or Television Film, NAACP Image Award for Outstanding Actor in a Television Movie, Mini-Series, or Dramatic Special and a Satellite Award for Best Actor in a Miniseries and TV Movie. ↑ The International Who's Who 2004. Europa Publications / Routledge. 2003. p. 1,271. ISBN 978-1857432176. ↑ Handy, David (November 7, 2014). "How David Oyelowo Approached the Daunting role of Martin Luther King Jr. in Selma". Vanity Fair. Retrieved October 10, 2016. ↑ "Oyelowo: British TV 'ignoring' black actors". BBC. 3 February 2015. Retrieved October 10, 2016. 1 2 "Golden Globe: 'Birdman,' 'Boyhood' and 'Imitation Game' Top Nominations". Variety. 11 December 2014. Archived from the original on 6 January 2015. Retrieved 11 December 2014. 1 2 "Oyelowo for Star Wars: Rebels?". Belfast Telegraph. 24 September 2013. 1 2 "David Oyelowo: An actor's life". The Independent. UK. 18 January 2007. Archived from the original on 6 October 2014. Retrieved 18 November 2012. 1 2 3 4 Gilbert, Gerard (February 8, 2013). "Upwardly mobile: David Oyelowo on going from Tooting Bec to Tom Cruise's jet". The Independent. Retrieved October 10, 2016. 1 2 3 4 5 "From Spooks to Lincoln, Complicit star David Oyelowo is about to make it big in Hollywood". Metro UK. 15 February 2013. Archived from the original on 6 October 2014. Retrieved 15 February 2013. ↑ West, Naomi (8 September 2007). "As he likes it". The Daily Telegraph. 1 2 Gilbert, Gerard (9 February 2013). "Upwardly mobile: David Oyelowo on going from Tooting Bec to Tom Cruise's jet". The Independent. UK. Archived from the original on 19 July 2013. Retrieved 7 April 2013. ↑ "Notices" (PDF). London Academy of Music and Dramatic Art. Spring 2011. Archived from the original (PDF) on 25 May 2012. Retrieved 7 April 2013. ↑ NationalYouthTheatre [NYTofGB] (2015-05-27). "Both #NYTalumni !" (Tweet). Retrieved 2015-08-14 – via Twitter. ↑ John, Emma (1 August 2005). "'In my head this is massive'". The Guardian. Archived from the original on 17 December 2014. ↑ "Small Island: David Oyelowo plays Gilbert". BBC. 14 October 2009. Retrieved December 31, 2013. ↑ Anthony, Andrew (4 April 2010). "Blood and Oil; Canoe Man; Ashes to Ashes". The Guardian. Retrieved February 28, 2014. ↑ Hughes, William (August 12, 2015). "Selma Star David Oyelowo to Play James Bond—in Audiobook Form". The A. V. Club. 1 2 Macaskil, Grace (27 September 2014). "Star Wars Rebels actor David Oyelowo had 'no idea' what he was auditioning for". Daily Mirror. Archived from the original on 2 February 2015. Retrieved 30 September 2014. ↑ Philbrick, Jami (11 October 2012). "IAR Exclusive Interview: David Oyelowo Talks 'Middle of Nowhere,' 'The Paperboy,' 'Lincoln' and 'Jack Reacher'". Retrieved 13 September 2014. ↑ Calhoun, Dave. "Cannes Film Festival 2012 line-up announced". Time Out. Retrieved 19 April 2012. ↑ The London Gazette: (Supplement) no. 61450. p. N14. 30 December 2015. ↑ "'Selma's David Oyelowo on Playing MLK and What It Means to Be a Christian". Sojourners. Retrieved 19 April 2012. 1 2 Taylor, Ben (2015-01-14). "David Oyelowo: 5 facts including wife, Selma and new movies 2015". Swide. Retrieved 2015-08-14. "David Oyelowo Interview". Streetbrand Magazine. Archived from the original on 14 January 2009. Retrieved 9 September 2013. Kellaway, Kate (8 July 2001). "My kingdom for a part". The Observer. Archived from the original on 13 December 2014. Retrieved 6 November 2007.